Cheesy Street Grill opened for business as a food truck in Bristol in June, 2014. The founding members were Lisa Dowd, Cameron Canzellarini and Geoff & Ann Howe. The truck catered to many companies during the week in CT, NY and MA; on the weekend it traveled to many events, such as Farmers' Markets, Country Fairs, Music Festivals, Charity Events, Weddings, Birthday & Graduation Parties! Lisa caught the cooking bug when recovering from surgery in 2005, and grew passionate about cooking food while watching Rachael Ray, Julia Child and Ina Garten. She would spend a great deal of time on the weekends cooking for family and friends. Lisa worked in ''Corporate America'' for 32 years, and decided to turn her passion for cooking into a business at the age of 50! A big fan of cheese (and wine! 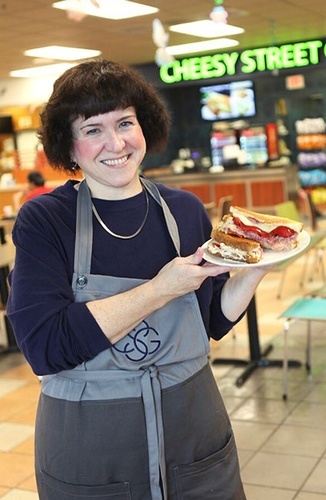 ), Grilled Cheese was chosen since this great comfort food is loved by people of all ages! While driving on the Mass. Turnpike (I-90) visiting her son in college in Boston, it occurred to Lisa that there wasn't anything like great, homemade comfort foods sold at the Service Plazas (Rest Areas) on the Pike … and the owners of the Plazas agreed! After phone calls, meetings, and contracts, Cheesy Street Grill was now able to serve the hungry travelers up & down the Pike! Cheesy Street Grill takes great pride on serving superior, high-quality ingredients and winning combinations for their sandwiches, and Other Comfort Foods. Great service is just as important as delicious food.